My daughter is in a High School Forensic class and has the following question from which we can not find a logical answer in her text book. 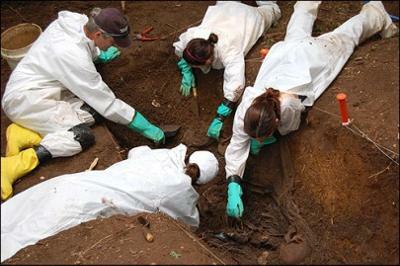 The question is, "A mass grave is found: What can you tell about the remains? h. Skull: one partial skull found with retangular orbits. a, b, and h we have the answers for, but c - g is rather vague and is not well explained in her book "Forensic Science, Fundamentals & Investigations" by Anthony J. Bertino. Chapter 13.